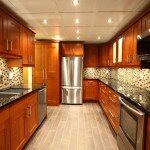 Home » Home Remodeling Blog » Get the Custom, Durable Flooring You’ve Always Wanted with Tile Floors! Tile floors are becoming more and more popular, and there are many good reasons why! Tile opens up countless design options, is very durable, and is very easy to maintain. There are so many different colors, styles, and textures within the world of tile that you will definitely find something you love. You can first choose which type of tile floors you want– natural stone tile, porcelain tile, or ceramic tile. Natural stone tile is very distinguished and gives any room a stylish finish. Ceramic tile is extremely durable and resistant to stains and scratches. Porcelain is an even tougher version of ceramic, and it costs less than natural stone tile. After choosing which type of tile floor best fits your tastes, there are even more choices when it comes to glazed or unglazed tiles. Glazed tiles provide a smoother look and are easier to clean, but can also show cracks and wear over time. Another benefit of glazed tiles is increased stain resistance and more color options. Unglazed tile floors are better for high-traffic areas of the home because they show less wear and tear and are less slippery, but on the other hand, that can make cleaning more difficult. Tile floors are a great option if you want a custom floor that is long-lasting and beautiful. With numerous options for colors, patterns, and styles, you’re sure to find the perfect tile floor that fits your needs at Jim’s Floor Depot. Give us a call today!